The Red imported Fire Ants entered the U.S through Alabama from South America around the 1930’s. These insects thrive in humid and warm climates and have slowly spread through the Southeast. 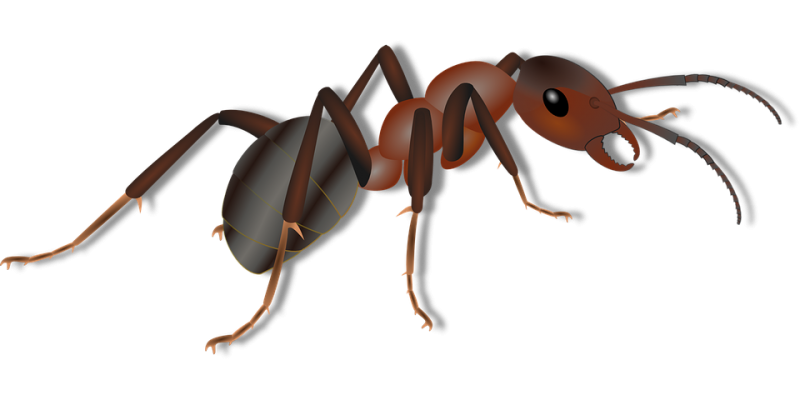 The fire ants are reddish brown, small ants with a measurement of around ¼ of an inch in length. These ants build big nests inside the ground, along with mounds that range in size from a couple of inches to around 2-feet in height. In some cases, fire ants may move into your home during excessive drought and heavy rains. The fire ant can become particularly troublesome in pasturelands that are undisturbed, where it is common to find several large mounds. This species of ants prefers to build their mounds in sunny and open areas such as lawns. It is also common to find mounds close to driveways and sidewalks that give off and absorb heat. In the well-maintained lawns, the mounds are usually not more than a couple of inches in height. However, the lack of these mounds around your yard is not an indication that these ants are not present. The fire ants are experts at creating elaborate tunnels underground which can extend as far as 25 feet from their mound. In periods of extreme heat or drought, the ants tunnel even deeper in the ground, where they won’t create mounds. These colonies often have 200,000 ants or more, which includes the queen who is responsible solely for laying the eggs. A sting from one or more fire ants is not something you will forget. These ants are well-known for attacking any threats to the nest in very large numbers. What this means is that you will usually be stung by many of these ants at once. Even though the stings are very painful followed by burning sensations, only a few people have an allergy to them. Even though permanently eradicating the fire ant is similar to trying to eradicate the cockroach or mosquito, with patience and persistent along with the right application of a good quality insecticide, you can control these pests. Today there are various methods and products used for controlling fire ants. When you use any pesticide, always follow the instructions of the label carefully and make sure you feel comfortable on how to use the product or contact pest control- Ziehler Lawn Care. Here are a few of the best ways to rid your lawn of fire ants. The fire-ant baits are made up of a type of pesticide that is combined into a material that the ants are attracted to and consume. This bait is then carried back into the colony where it will be fed to the other ants, which includes the queen. This process can take some time, making the baits one of the slower methods to control these pests. The baits can either be applied across your yard or on individual mounds. The results are regarded as more effective when residents come together and treat the entire neighborhood at the same time. When using one of these baits, ensure it is fresh. Apply when your grass and the ground is dry and ensure that there are no predictions for rain for at least 24 hours. It is also best to apply your bait when worker ants are searching actively for food. The ants are far less active in very hot, or rainy and cold periods. You can apply the bait over areas using a push or hand-held fertilizer spreaders. The baits are available in many forms with different type of active-ingredients. Certain products, like the ones that contain acephate, which are applied in a dry-dust form. The ants walk through treated soil where the dust clings to their bodies. They then transport this insecticide back into their mounds. With this method you can expect the colony to be killed entirely within a couple of days. When using a dust distribute the amount recommended over an undisturbed mound. When treating single mounds using granular products, measure out the suggested amount followed by sprinkling the product around and over the mound. Dependent on the product you may need to water the granules, using a sprinkling can which break the stream of water up by gently pouring around 2 gallons of water on top of the mound, which wash this product into the surrounding soil. Certain insecticides will require mixing the product with water followed by applying it onto a mound which drenches it. It will kill all the ants underground, yet you need to ensure you apply a sufficient amount so that it can penetrate through to the nest. In general, about a gallon of the diluted mixture which is poured slowly over each mound is a fast-acting method that will typically eliminate the mounds in 24 hours. Some of the active ingredients like citrus-oil extract, boric acid, rotenone, pyrethrum, diatomaceous earth and pyrethrin are classified as organic pesticides. A few of the popular brand names include Organic Plus Fire Ant Killer, Organic Solutions Multipurpose Fire Ant Killer, Insecto Formula 7 and CitrexTM. The fire-ant baits which contain spinosad as an active ingredient are also appropriate to use for the organic gardeners. This type of product is one of the better ways to control and eliminate fire ants that have invaded vegetable gardens. There are a few of the home remedies which are not effective. For example, spreading grits over fire ant mounds just provides a source of food for the ants. Laying grapefruit or orange peels over the mounds will just make the ants move to another area. One of the other methods of shoveling mounds over other mounds to try and get the ants to fight and kill one another is also not effective. Avoid using petroleum or gasoline products to kill fire ants in your lawn. They may kill the ants, but they will also kill your plants and your grass. You can learn more here about how to irradiate these ants.